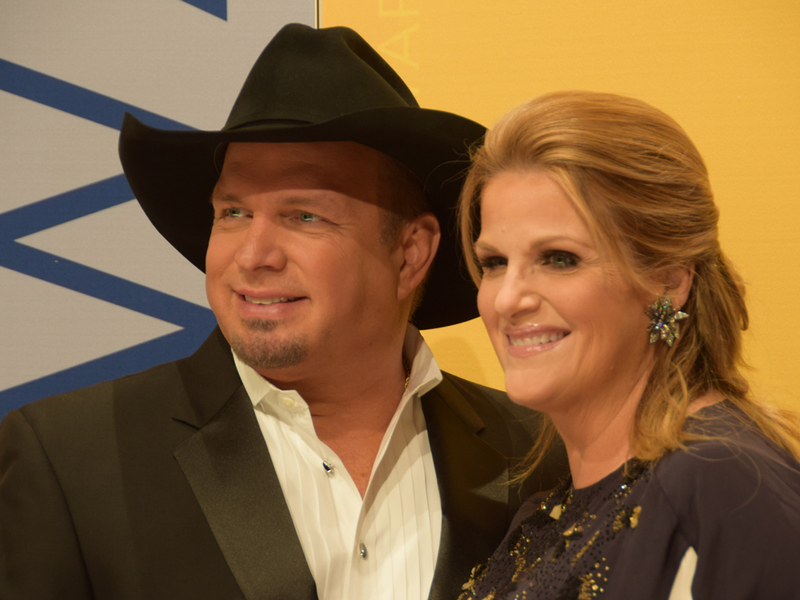 Garth Brooks and Trisha Yearwood’s road to holy matrimony was a long journey. They were both previously married, and it took Brooks’ divorce and Yearwood’s two failed marriages before they were able to take their friendship to the next level. When the stars aligned, the couple tied the knot in their Oklahoma home in front of a guest list that included just four family members. They’ve gone on to make sweet music together, including the 2016 duet album, Christmas Together. Now that they’ve cemented themselves as the reigning king and queen of country music, their bond as husband and wife appears to be unbreakable, but also a little unorthodox. Let’s check out some of the odd things they’ve revealed about their romance. rooks and Yearwood met in 1987 while recording a demo at songwriter Kent Blazy’s studio. Yearwood was paid $10 for her work, while Brooks walked away without a dime, according to CMT. But he did receive something else that was invaluable: that fateful first meeting with his future wife. They immediately hit it off, but Brooks was married to his then-wife, college sweetheart Sandy Mahl, and Yearwood was married to her college beau, Chris Latham. They had no choice but to keep things platonic. Brooks even promised that Yearwood could open up his shows as soon as he signed his record deal — a promise he delivered on once he made it big. In an interview with The Ellen DeGeneres Show (via Country Living), Brooks said when they first met, he was swept away by the feeling “like when you just meet your wife.” Despite those strong feelings, he tried to make his first marriage work and had three children with Mahl. By 1999, Yearwood had divorced her second husband, Bobby Reynolds, and by 2000, Brooks and Mahl had called it quits after 14 years of marriage. In 2001, Yearwood and Brooks were finally free to be together, and by 2005, they were married to one another. It seems like the only place Brooks wants to be is right by Yearwood’s side. Even after so many years of marriage, the “Ask Me How I Know” singer is still head over heels for his bride. Brooks was clearly poking fun at their dynamic because the adoration is clearly mutual. During that same interview, Yearwood called Brooks her “biggest cheerleader” off and on the stage and said even when they’re not all “lovey-dovey and passionate,” they’re still the best of friends. They might dominate the top of the country music charts, but when it comes to the tunes they enjoy during their downtime, this pair is a fan of pop music. For Yearwood’s 53rd birthday, Brooks surprised her with a impromptu trip to Louisville, Ky. to see Bruno Mars perform live, according to ET Online. In a Facebook post, Yearwood said she wasn’t sure “who had more fun” at her birthday — her or Brooks! Judging by their photos from the concert, it’s safe to assume they both had a blast. Sounds like the perfect hook for his next chart-topping love song, doesn’t it? Yearwood and Brooks’ marriage runs much deeper than their devotion toward one other. They also go out of their way to put a smile on other married couples’ faces. The country superstars footed the bill for a newlywed couple’s Hawaiian honeymoon, and they also sent wedding gifts to another set of fans, according to CBS News. Jude and Jamie Blanchard attended Brooks’ Louisiana show while holding a sign that read: “Best Week Ever. Garth this Friday, our wedding next Friday.” When the singer spotted the sign in the crowd, he serenaded the couple with the song “To Make You Feel My Love” and also asked them if they wanted him to purchase anything from their wedding registry. Jumping at the chance to be the recipients of the singer’s generosity, the couple pulled out a wedding invitation, and concertgoers passed it along until it reached the stage. Soon thereafter, the newlyweds reportedly received “a pair of lounge chairs, a KitchenAid mixer, and other items” delivered to their doorstep, according to The Daily Advertiser. The gifts, of course, were from none other than kind-hearted Brooks and Yearwood. In an interview with Today, Yearwood bashfully revealed that Brooks’ nickname for her is the “Queen.” She has pleaded for him to simply call her “Trisha,” but it looks like the affectionate nickname won’t be going anywhere anytime soon. It can be difficult for two successful stars in the music industry to spend quality time together due to their conflicting schedules, but when Yearwood and Brooks tied the knot in 2005, they made a pact to never be apart. Brooks was retired when they walked down the aisle, but Yearwood was still working. In an effort to be by his side, she cut her tour dates “way down,” she told Parade, and eventually, she quit touring entirely and decided to create a series of cookbooks and host her own Food Network cooking show, Trisha’s Southern Kitchen, so that she could have “something to do creatively” at home without being away from here husband. When they do perform, they make an effort to hit the road together, too. The duo embarked on a joint three-year world tour in 2014.
Who needs Starbucks when you have your own personal barista at home? Yearwood really has it made because she can get her caffeine fix every single morning without lifting a finger, thanks to Brooks. While speaking to People magazine (via WKML), Yearwood revealed that part of Brooks’ morning ritual includes preparing her coffee in the wee hours of the morning. And get this: Brooks isn’t even a coffee drinker himself, according to The Huffington Post. That’s right, the guy sacrifices his sleep just he can make a cup of joe for his beautiful wife. Now that’s what we call true love!